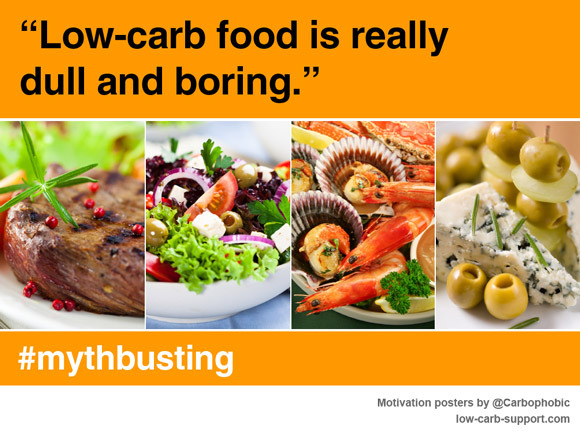 What’s the best way to change from traditional to low-carb foods? The most important factor is getting educated about carb content of foods. You will need to get into the habit of checking and tracking the carb content of everything you eat. You will need to change your eating habits, and structure your meals in a different way. 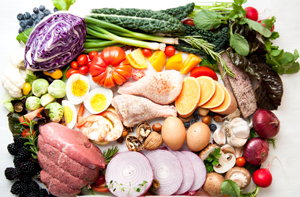 Start by checking out our brief guide to low-carb foods, and an article on low-carb food shopping. Side dishes. Most Western and Asian main meals include a side dish that is high in carbohydrate – fries, pasta, rice, roast potatoes. Bread and baked goodies. Bread and baked treats are everywhere. Bread is often offered as a starter in restaurants, or to accompany soup. Sandwiches and wraps come with bread. And we all think of cakes and biscuits as the best treat. Breakfast. Typical breakfast food is also laden with carbs – croissants, cereals, oatmeal, pancakes, bananas etc. Desserts and sweets. We all love desserts, but they are packed with sugar and are the ultimate high-carb food. These are the biggest danger areas. You need to find low-carb alternatives for these typical high-carb foods. Before you run for the hills, please read the rest of this page. There are ways to manage these changes – and still enjoy your food. Any protein-based main meal can be adapted for low-carb diet. Starchy side dishes would have to go. Instead, you can have salads or cooked vegetables on a side. Low-carbers have developed many ingenious tricks to make side dishes interesting and satisfying. For example, boiled or mashed potatoes can be substituted with cauliflower. You can make “zoodles” or use shirataki noodles instead of the real thing. This change will benefit your digestion. If you sometimes feel bloated and sluggish after meals, this will no longer be the case. More about low-carb alternatives to common carb-based dishes. What about low-carb breakfast foods? Breakfast is just another meal. There is no law saying that you must always have carbs for breakfast. If you think of it as just another meal – just like lunch or dinner – it will be easier to choose low carb options. Have a look at our list of low-carb breakfast foods. There are also plenty of low-carb breakfast recipes to imitate the more traditional foods. And bread? How am I going to cope without bread? You can make low-carb bread from scratch using nut flours and seeds such as flax. You can also find ready-made low-carb bread online and from specialist retailers (but making your own is always better). It won’t be exactly the same. But it will be low-carb. And it is likely to be much better for you. Gluten in modern refined white flour is the cause of many health woes, way beyond the high carb content. Will I never get to eat anything sweet again? Of course you will. There are plenty of sweeteners that taste just as good, but come with little or no carb content. You can make your own low-carb desserts from scratch, using sweeteners and low-carb ingredients. And you are actually allowed chocolate! As long as it’s sugar-free – and it is now quite easy to find products that are. Watching your carb-eating friends enjoy freshly-baked bread with butter in a restaurant can be agonising. Focus your mind on the fact that refined white flour is really bad for you (on many levels), and ask the waiter for some nuts or olives to nibble on. Desserts are of course another danger area. If there is cheese available instead, go for that. If you absolutely can’t help yourself, ask for a bite or two of someone else’s dessert rather than ordering your own (hopefully you will be too embarassed to eat a lot of it that way). Have a look at our guide to different cuisines when eating out on a low carb diet. Is it going to be basically very dull and boring? No! A low-carb diet can be very rich and satisfying. Much more so than other types of diets that restrict fat and/or calories! You will enjoy food more and have fewer cravings. Check out these great low-carb recipes, low-carb cookbooks and blogs for some ideas of satisfying and diverse low-carb meals.